One of the determining factors for this summer’s route was Nick’s Dad’s 80th birthday celebration. The whole family descended upon Bethel, Maine from three continents for seven nights. 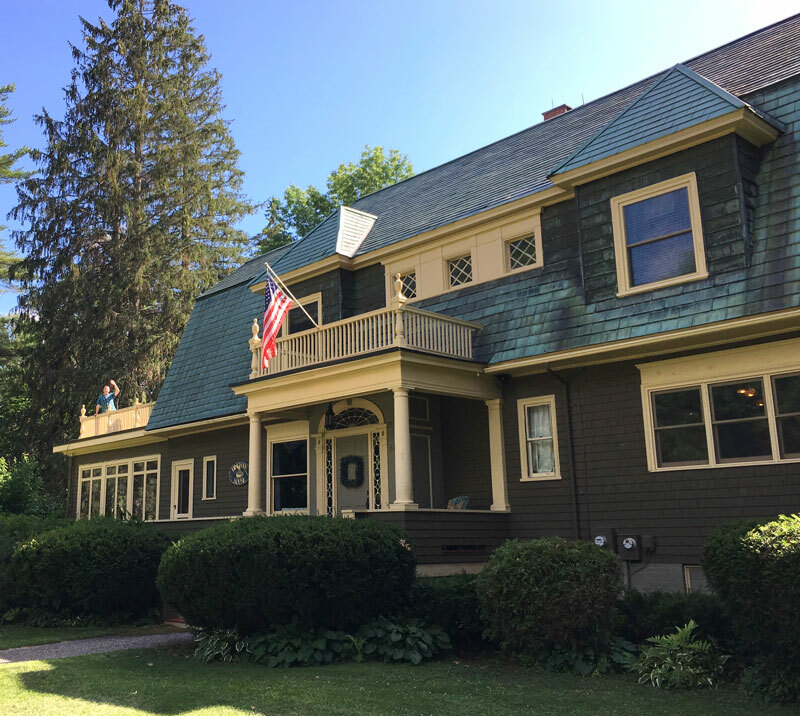 Finding lodging to satisfy the needs of 14 is not an easy task, but after scouring listings on vrbo.com, the historic Bingham House mansion emerged as the best candidate. The house was large enough that every family got their own quarters and there was a variety of rooms to hang out. The enormous kitchen made it easy to cook for up to 16 people and the hot tub just off the back deck was a great place to relax under the stars after a day of hiking. The Bingham House is adjacent to the Bethel Inn Resort, so use of the pool and a lake house on nearby Songo Pond is included with the Bingham House rental. The village of Bethel is located in western Maine, remote enough to be relaxing, but close enough to civilization that there’s never a shortage of activities. The permanent population is only about 2,600, but tourism supports a larger shop and restaurant industry than you would expect. The area is a year-round destination, with the Sunday River ski resort just 15 minutes away. In summertime it is busy with people riding the gondola and mountain biking the slopes. We were particularly drawn to the area for Sunday River Brewing, a brewpub just off the main road to the resort. When we needed some away time, we headed there to enjoy a flight of eight beers, and when we needed a quick breakfast, we picked up a dozen of their famous fresh-baked donuts. The well-stocked local market in Bethel supplied everything we needed for cooking and when we felt like eating out, there were plenty of options. Sunday River gondola, Sunday River Brewing, kayaking on Songo Pond. One of the highlights of any vacation for us is hiking, and this region didn’t disappoint. There are trails of all lengths and for all abilities nearby. For the first hike of the trip, we chose a little warmup route to Bucks and Lapham Ledges just east of Bethel along highway 26. Mostly gentle grades with just a couple of steeper sections led us first to Bucks Ledge and then a spur trail to the south led to Lapham Ledge. Both feature rock outcrops with beautiful views of the surrounding mountains and lakes. At 3.5 miles it was a good way to prepare for the longer hikes in our future. Holding on tight on the way up to the Eyebrow. The very next day we scouted out some more mountainous terrain a half hour north of Bethel at Grafton Notch State Park, one of Maine’s premier pieces of public land. This 3,129 acre park and adjacent Mahoosic Public Lands have a ton of hiking options, from mini loops just off the road up to a rugged 12-mile portion of the Appalachian Trail. We were looking for something in the 2-3 hour timeframe, so chose the 2.5-mile Eyebrow Loop. From the parking area, this trail first rises gently, but then climbs an extremely steep route up a mountain. Chains, metal rungs and ladders are anchored into the rock to assist the climb. It gains about 1,000 feet in just over a mile to the loop’s highest point. A point atop the exposed rock “eyebrow” gives a fantastic view down into Grafton Notch, with Old Speck Mountain rising to the right and Baldpate Mountain to the left. To complete the loop, we continued on the Eyebrow Trail a bit farther until it intersected the Appalachian Trail and followed that back down to the parking area. A stream with several small waterfalls and cascades flows alongside this portion of the trail. If we’d been able to do a longer day hike, taking the Appalachian Trail to the summit of Old Speck, Maine’s fourth highest peak, would have been a great option. Instead, we joined the rest of the group to visit some of Grafton Notch’s more family-friendly sights. Just off the main road there are lots of things to see that require minimal walking. The best is Screw Auger Falls, where the Bear River has cut a narrow, twisting gorge through granite. The main drop is 23 feet high, and above and below are a series of smaller cascades. There is a lot of smooth, exposed rock for lounging and several people were wading in the cool water when we visited. It’s a great picnic spot as well. Just over a mile further north is Mother Walker Falls, where the Bear River tumbles over several small cascades at the bottom of a gorge. It’s not as impressive as Screw Auger, but worth a quick stop if you’re not in a hurry. Nearly back to the Appalachian Trail parking area is Moose Cave, a 0.4 mile loop through a mossy forest to a place where a slab of fallen granite has created a “cave” that the river flows through. This was a great one for the kids. The rock area just above Screw Auger Falls at Grafton Notch State Park. 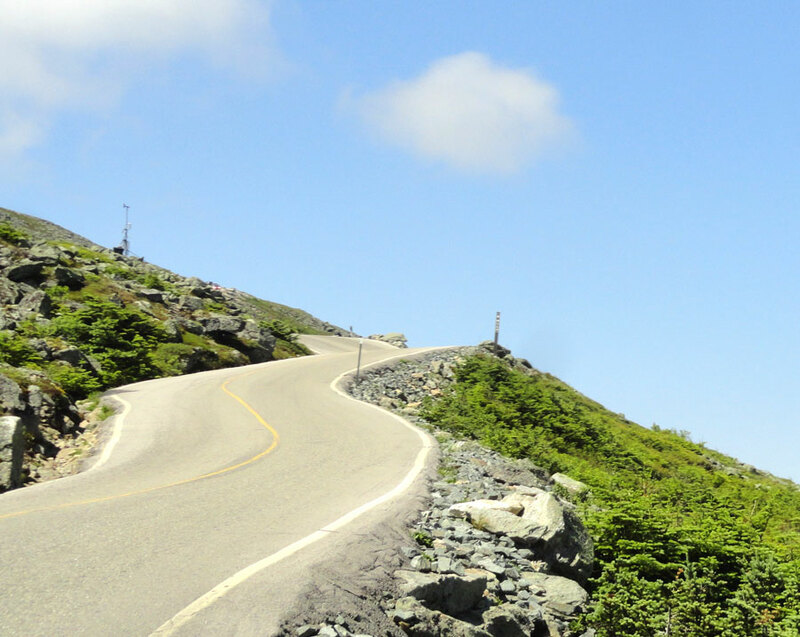 Our mid-week plans involved a day trip to nearby Mount Washington in New Hampshire. At 6,289 feet, its summit is the highest point in the northeastern United States and the most prominent (base to summit) east of the Mississippi River. The mountain is also famous for having some the most erratic and extreme weather on Earth due to the Presidential Range’s location at the convergence of several common storm tracks. The Mount Washington Observatory has been collecting climatic data from the summit since 1870, the first such station in the world. On April 12, 1934 instruments observed a wind speed of 231 miles per hour, which is still a record for straight line winds not associated with a tropical system. If you’ve ever seen videos of meteorologists being blown around, there’s a good chance they were on the observation platform on top of Mt. Washington. We planned an early arrival to have the best chance of having clear visibility as the summit is notoriously cloudy later in the day. The Mt. Washington Auto Road is just 40 minutes by car from Bethel. This route climbs 4,618 vertical feet to the summit over the course of 7.6 miles of twisting asphalt and can be driven in private vehicles for a fee. Upon arrival at the summit, it was much cooler and windier, with some fast-moving clouds just skimming the top. By the time we browsed the museum and assorted buildings, the clouds had blown away and we had a perfect, sunny day with views extending 100 miles in all directions. Another popular option for reaching the summit is the Mt. Washington Cog Railway, which makes a three mile ascent up the opposite (western) face of the mountain. Colorful trains carrying hundreds of visitors arrived and departed constantly during our visit. View from the top of the Tuckerman Ravine Trail on Mount Washington, NH. By far our most serious hike in the Bethel region was here at Mt. Washington. We parked our car at Pinkham Notch and hitched a ride to the top with others in our group since we planned to hike down via the Tuckerman Ravine Trail. Many miles of hiking trails crisscross the slopes of Mt. Washington, so there’s no shortage of options. 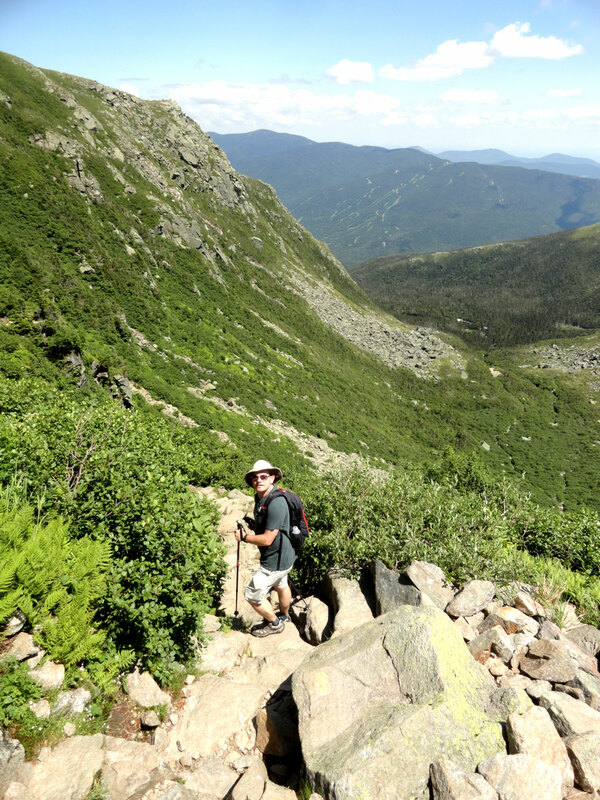 Tuckerman Ravine is a convenient option for a day hike since both ends are easily accessible. The trail starts right from the parking lot at the summit and crosses a boulder field for about the first half mile. Cairns mark the way across large, craggy rocks and down a steep decline. This portion was fairly crowded because lots of people hike down just a short distance and then climb back to the top. By the time we got to Tuckerman Crossover, we had lost most of the crowd and were beginning to meet people who had started at the base earlier in the day. Seeing their expressions reaffirmed our decision to only hike down and not up. A little further along, we arrived at the lip of Tuckerman Ravine, a yawning, U-shaped valley of rocks and trees. The slope went from steep to nearly vertical. Nick commented “This is the high-fatality part,” referring to the sign at the museum that marked all deaths on Mt Washington. For a half hour, we made our way down with waterfalls splashing down the rocks adjacent to the trail. Nick had one minor slip and was nearly taken out by a falling rock knocked loose from a girl above, and we saw a man with blood running down his leg, so there are definitely hazards. Nearing the lower portion of the ravine, the trail flattens out to a reasonable slope and passes through beautiful evergreen forests before arriving at the Hermit Lake Shelter at mile two. Checking our watches, we realized we’d left almost exactly two hours prior. One mile per hour is definitely not a hiking pace we’re accustomed to. While eating our packed lunch and resting our feet, we chatted with a few hikers traveling both directions, but we’d mostly achieved solitude on the busy mountain. The next two miles are less steep than the upper two, but it’s still a surface of large rocks that requires careful foot placement with each step. Approaching the home stretch, the 100ft Crystal Cascade can be viewed from a small rock overlook. The 50 steps to get up to it are worth it. In total, the hike covered 4.1 miles and descended an incredible 4,239 feet. That’s one of the most consistently steep hikes we’ve ever done. We also lucked out on having a completely clear, sunny day as we hiked. Mt. Washington was the literal high point of the trip, but the highlights were just getting started as we departed Bethel and headed toward Canada. See the full gallery of images from the trip. 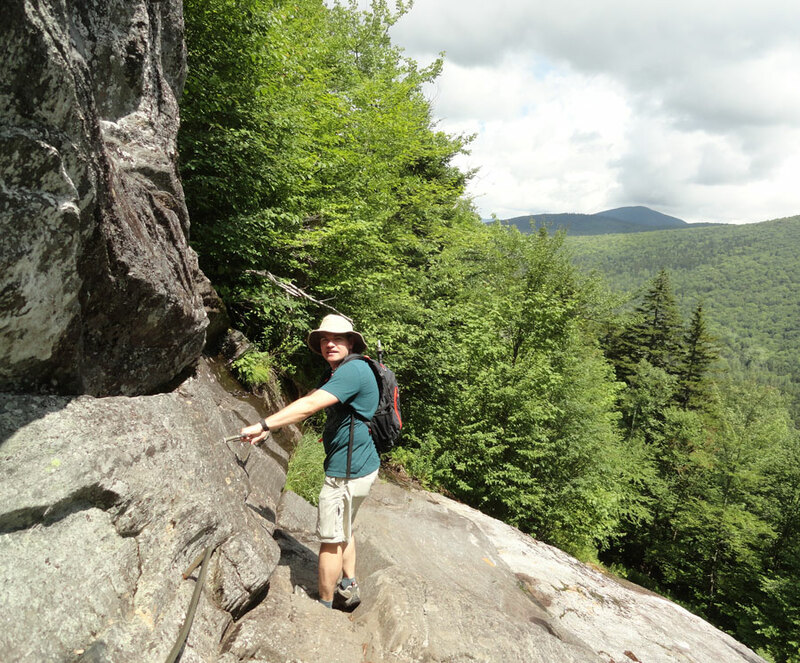 This entry was posted in Destinations, Travelogues and tagged bethel, Bethel Maine, Bingham house, Bucks and Lapham Ledge, Eyebrow Loop Maine, Grafton Notch, Mount Washington, Pinkham Notch, Screw Auger Falls, Sunday River, Tuckerman Ravine. Bookmark the permalink.